Arrowtown has just one option for public transport around the basin: the Orbus scheduled service. There are also several taxi companies and Uber started operations here in 2018. 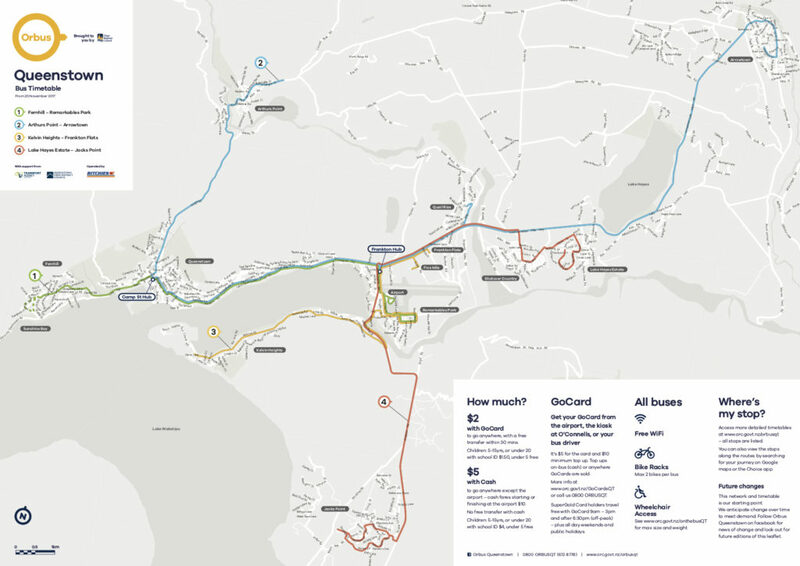 Otago Regional Council’s subsidised Orbus service will take you anywhere on their Queenstown bus network for a $2 fare. You can pop your bike on the front (maximum two bikes) and even enjoy free wifi. To get the $2 fares you’ll need to use a GoCard smartcard to pay for your ride. GoCards can be bought on the bus (cash only), at Queenstown Airport or at the O’Connell’s Mall kiosk for $5. The minimum top up for GoCards is $10. GoCards can be topped up anywhere they’re sold, and an online top-up system is planned. The service can be used without a GoCard by paying cash on board, with a cash fare of $5 per trip for an adult and $3 for a child – or for trips that begin or end at the airport, $10 for an adult and $5 for a child. The Arrowtown return route runs from Arrowtown Four Square to Arthurs Point, via Ramshaw Lane, Lake Hayes Road, Quail Rise, Frankton and Queenstown. The first bus leaves the Four Square at 6.02am and the last arrives back at 10.54pm. In between they operate every half hour during peak times and every hour off peak. Adamson Drive near the Four Square. At Frankton you can switch buses on the same fare to get to the airport, Remarkables Park, Kelvin Heights, Lake Hayes Estate, Jacks Point and Fernhill. Just make sure you tell the first driver what your final destination is so you get the right ticket. To help plan your trip there’s an browser-based journey planner on the ORC website or you can use NZTA’s real-time Choice app (download from App Store or Google Play). There is also a downloadable timetable and map.